With an 800° F maximum temperature, these Heat-Reflective Aluminized Pads are constructed of Aluminized Rayon, which has an aluminum coating that reflects radiant heat over a rayon base layer that's light, flexible, and moisture absorbent. They have a Felt lining and a 9 in pad length. They are one size fits all and are aluminized on the back of the hand. They are silver in color. Includes 1 pair. 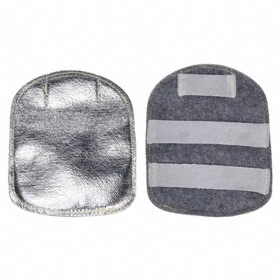 Wear these aluminized pads over the back of your welding gloves for added heat resistance. The shiny material reflects up to 95% of radiant heat away from your hands to keep them cool.